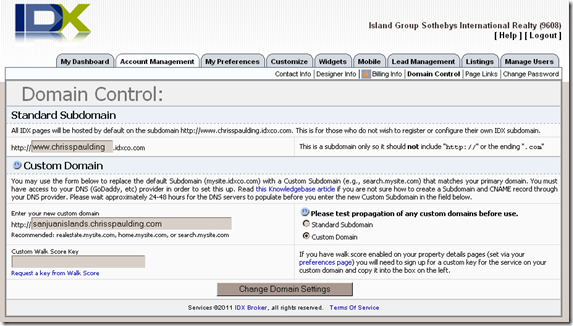 The first step was to createa new subdomain on my webhost… I used sanjuanislands.chrisspaulding.com … then I had to go into create a CNAME for it per these instructions … .Then I waited a day or two and proceeded to the next step. 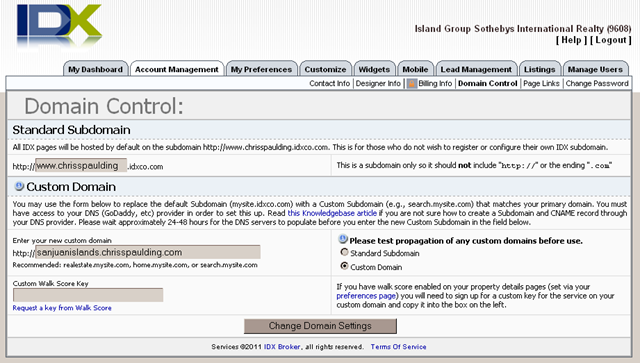 I got logged into idx broker and went to the “Account Management” tab and the “Domain Control” sub-section. Here are the settings I put into the “Custom Domain” field… and then selected the “custom domain” radio button… then clicked “Change Domain Settings”…. Previously all our links on our site looked like this : http://www.chrisspaulding.com.idxco.com and now all links will look like this: http://sanjuanislands.chrispaulding.com . All the old links hardcoded into www.ChrisSpaulding.com linking to the old chrisspaulding.idxco.com subdomain still worked and actually forwarded automatically to his new custom domain. I still changed all the links on our site using our Dreamweaver template and some search and replace. The next thing I did was copy in my GAAddons script to properly track traffic accross the domain and subdomain… previously I was doing this via another inferior method. 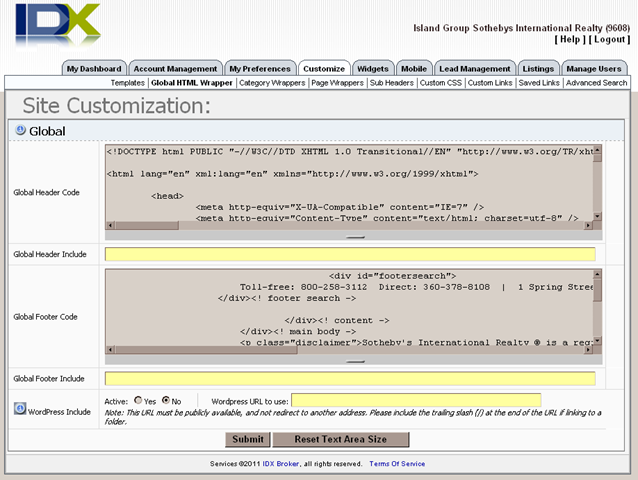 The GAAddons script does a few extra things to enhance analytics ( outgoing click tracking for one ). 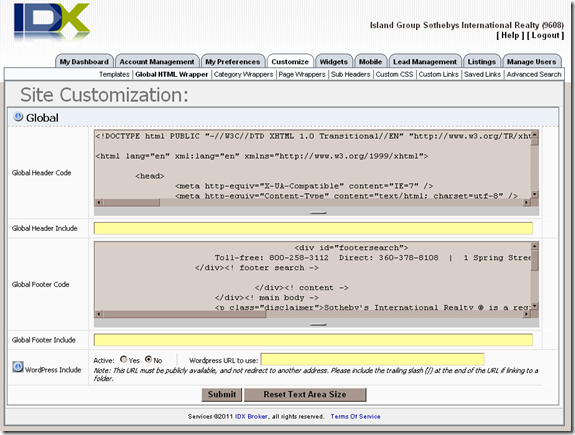 Next we needed to change the “Global HTML Wrapper” code in the idx broker dashboard… I just replaced chrisspaulding.idxco.com with sanjuanislands.chrispaulding.com again in both the Header Code and Footer Code. I also updated the GAaddons analytics script here before submitting my changes. Next I visited the site and made sure all was working without a hitch ( which it was ). Next on my list was to setup google analytics so I could segment the subdomain traffic from the main domain traffic.